If you are spending $17 per 12 oz bag of coffee and not spending the time and effort to perfect your water, you may be missing out on many of the hidden flavors still locked in the beans. So how do you perfect your water? Find out here! Bean origin: Not all beans have the same chemical composition. Bean roast: The chemical composition of the coffee bean changes throughout the roasting process. Size of coffee grindings: A consistent particle size is important, as the higher the surface area, the faster the extraction. Dry mass of coffee grindings: A different extraction composition. Temperature of extraction: The temperature dictates both the rate and composition of the extraction. Pressure of extraction: Has a similar effect as temperature. Time of extraction: Increasing extraction time allows for greater extraction. The water: The variable is less obvious, but it is clear that the chemical composition of water (i.e. 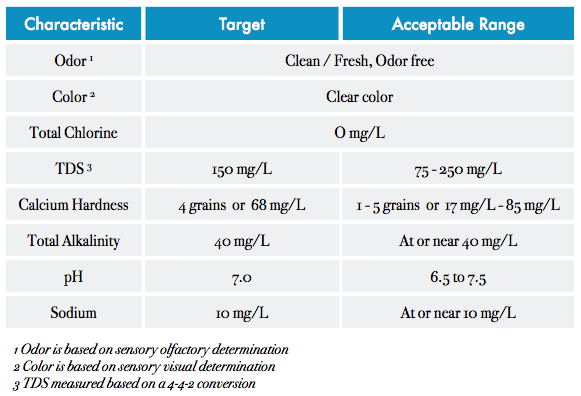 dissolved ions) play a very important role. The least understood, but likely most important is the water. Yes. If you are spending $17 per 12 oz bag of coffee and not spending the time and effort to perfect your water, you may be missing out on many of the hidden flavors still locked in the beans. Water is a canvas for these flavors. The mineral composition and chemistry of the water is as much a determining factor to what you are tasting as the beans themselves. However, recent research has uncovered that it isn't necessarily the overall total dissolved solids (TDS), but the actual minerals that are dissolved. Christopher Hendon (a PhD student at the University of Bath) and Maxwell Colonna-Dashwood (a World Barista Championship finalist) have studied the chemical composition of water and methods to deliver the best flavor. The study also found that sodium rich water, such as that produced by water softeners, didn’t help the taste of the coffee either. Achieving this water nirvana is both extremely difficult, expensive and depends on the beans that you are using. However, cafe owners and roasters have started taking notice. 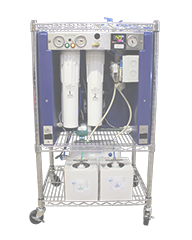 There are now commercially available systems that will strip the water with reverse osmosis, and then re-add the ideal elements for better tasting coffee ("formulating water"). 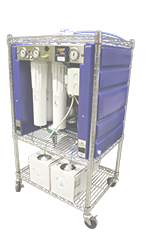 GC Water is one of a number of growing companies offering these systems to restaurants cafes. "After extensive cupping's using formulated water compared to various other sources, the benefits of this system were crystal clear. The role of water does not play second fiddle to sourcing and roasting coffee. They all share equally important roles in creating that elusive "perfect cup." Measure: Spend some money testing your water to see what you are starting with. This isn't just for hardness - measure the other minerals in your water as well. It is important to know that your municipal tap water quality will vary dramatically from month to month. A rainstorm has a tremendous impact of water minerality, for example. Taste Test: Taste test as much water and coffee as possible. Can you tell a difference between certain types of water? This is easy to do with bottled water. For example, try Acqua Panna water (a high mineral favorite among Italian espresso machine manufacturers) with your favorite beans, and then test your water versus this to see where your municipal water is lacking. Filter: Review filtration company test results to see what filters get you to the magic TDS amounts. If you are nerdy home enthusiasts like us, you will find a long, fun process of determining water quality and what you prefer for a relatively small price. Keep in mind, that while researchers have shown that water softened with sodium might not be best for flavor - SOFT WATER IS ESSENTIAL FOR ESPRESSO MACHINES TO FUNCTION CORRECTLY. Read more about the importance of water and your machine in our blog.